TAGS volunteers, along with Santa, Lin Bransom, and photographer, John Hudson, made a visit to Mosaic Dallas in Carrollton, Texas on December 22, 2010. 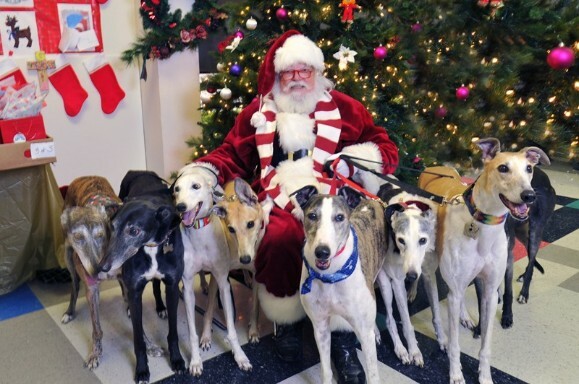 Look at Santa and his reindogs (or grey deer). 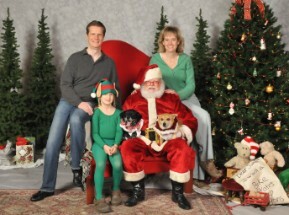 November 20 and 21, 2010 was a little ahead of schedule for Santa, but that was the weekend TAGS wanted all good dogs (and humans) to have their pictures made with Santa and shop at the TAGS holiday store. 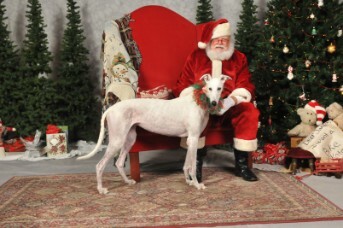 TAGS’ second year of Santa photos was even more successful than the first year. This year the two-day event brought many breeds of dogs, lots of families and children (only a few with tears) and adults who still asked Santa to grant their wishes. TAGS President, Kris Schuster, and photographer, John Hudson, together with Santa, Linden Bransom, made it all happen. From set up on Friday to take down on Sunday, TAGS volunteers made it all look so easy (although we all know it isn’t). A special thanks to these TAGS volunteers: Kris Schuster, Debbie Canterbury, Jayme Skelton, Barb Bray, Claire Pulfer, Suzanne Griggs, Abbe Collins, David Cole, Helen Tuohy, Suzanne Cody, Melissa Cody, Ken Spurlock, Jonna and Mike Mayes, Joanne Smith, Jackie and Gary Matney, Gail Bond, and Deann Haggard. As you can see it takes lots of energy and muscle to pull off an event like this. Saturday, November 6, 2010, was indeed a glorious day for All God’s Creatures at Central Congregational Church. The day was sunny and beautiful and the dogs shone as well. 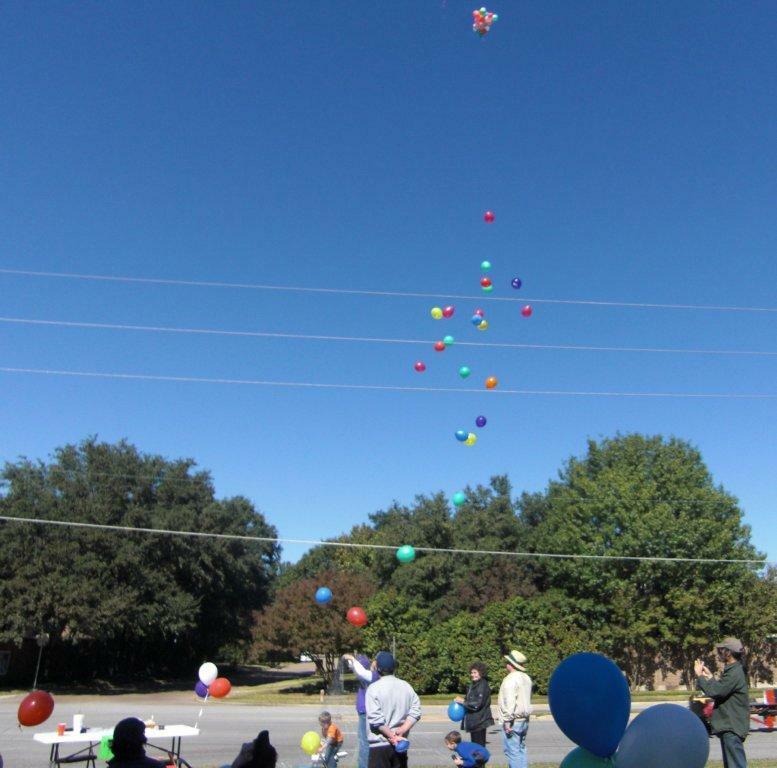 The animals were blessed and memorial balloons were released. 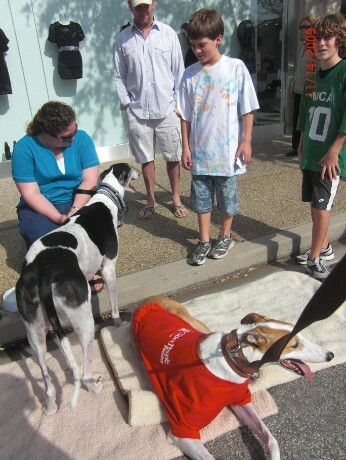 TAGS’ adoptable Greyhounds Wray, Sissy, Annabelle and Ringo were on their best behavior and greeted everyone who came by – whether they intended to pet a Greyhound or not. There was a lot of interest in all the dogs, but Ringo won the prize. TAGS received an application to adopt Ringo. Not only did he find a home, but he and his new family were blessed. Thanks to all who participated and spread the word about Greyhounds. 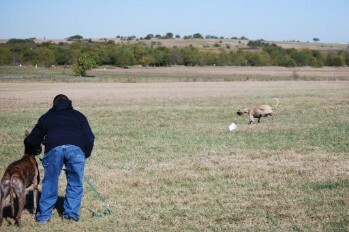 For those of you who attended the lure coursing event with your dogs at the home of Sam and Deann Haggard in Celina on October 30, 2010, you know how much fun it was – for people and dogs. It started early (before 9 a.m.). 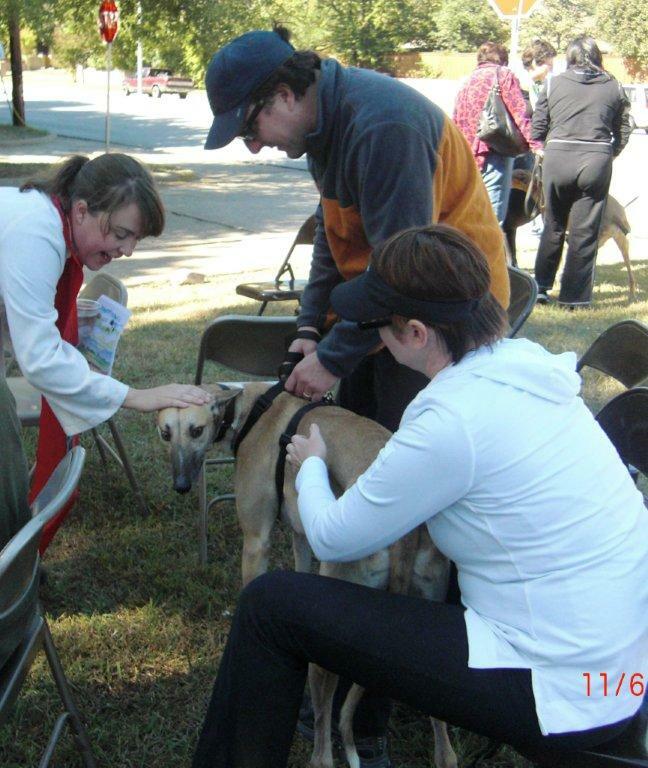 A number of breeds were represented – greyhounds (of course), basenji, borzoi, Irish wolfhound, and Italian greyhound. The weather cooperated (a little cool and breezy in the early morning but warm and sunny in the afternoon). This was a day for beginners, especially the Greyhounds. Sometimes you think your hounds would just love to do this and then they show no interest. You might think your dog is too into her retirement to care about chasing a white lure. Maybe you think your grey is too old to have much interest. You never know until you try it and then you are surprised!!! Ten year old girls, Bella and Sophie had an absolute blast. They may have forgotten their age on Saturday, but I bet on Sunday it all came back to them. A few of the dogs started off well but lost interest before the end of the course. 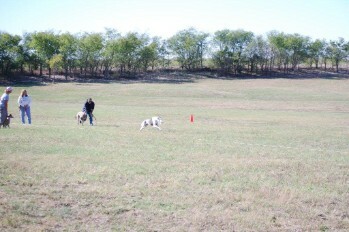 Lacy and Wiki had fun running for a while but found many things on the course of interest and wanted to investigate. It’s rather informal. You just hold your dog until they tell you to go and then you release them. Then it’s up to the dogs to follow the lure and stay on the course (or not). One of the dogs, Flower, ran past all of them. In fact she was certified and can now compete. Her qualifying run was against a Borzoi and Irish Wolfhound and she blew past them on a turn like they were standing still (In fact they had taken a short turn and Flower went to the end and made the full turn and still passed them). Flower stayed with the lure and ran the course to the end – all by herself. Her housemate, Dasher, was almost as fast. Not all of the dogs, however, ran the course. TAGS’ fosters, Ringo and Wray had to watch from the play yard, along with some of the others that just came to hang out. Let me rephrase that – Ringo lay in the sun (April, your pictures of Ringo were great) and Wray raced the fence line (with Vixen) just chomping at the bit to get out on the course. The Greyhounds that did not lure course had the chance to just hang out together in the fenced play yard. That’s also where the racers came to cool down and rest after their strenuous exercise. A special thanks to Margo Rye for taking all the wonderful pictures that capture much more than words can. And if opening their property to all the dogs wasn’t enough, the Haggard’s provided lunch for everyone on the deck. After lunch, the Haggard’s Greyhound, Guinness, came home. 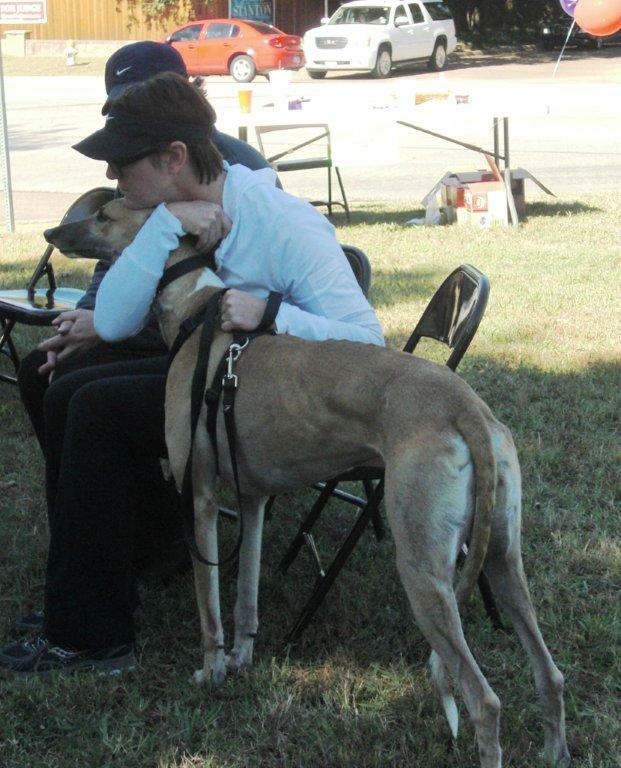 Guinness was the 2009 U. S. Lure Coursing Champion and because of a toe injury he is retired. However, the will to run is still there. He can’t be satisfied to watch the others run without wanting to run himself, so he was not there while the others ran. At least he got to see all his buddies. Deann and Sam, everyone had a blast. Thanks to both of you for hosting such a fun day. There’s nothing like watching a Greyhound run through an open field on a sunny day!!!! Many thanks to our volunteers who braved the weather on Saturday to promote a safe Halloween sponsored by Twin Creeks Village in Allen. TAGS set up in front of the Petco prepared to have a SpookTAGular event and so we did with the kids in costume and passed our candy while the pups received lots of attention. Of course we didn’t really anticipate just how “spooky” things would get until the skies opened up and the rain poured down and the tornado sirens sounded. 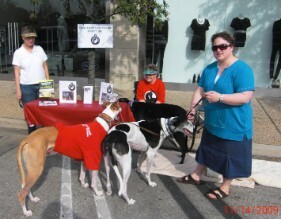 We moved the volunteers and greyhounds closer to the store under the covered canopy for another 30 minutes and the weather only got worse so we called it a day (like most the other participants) and headed for home. 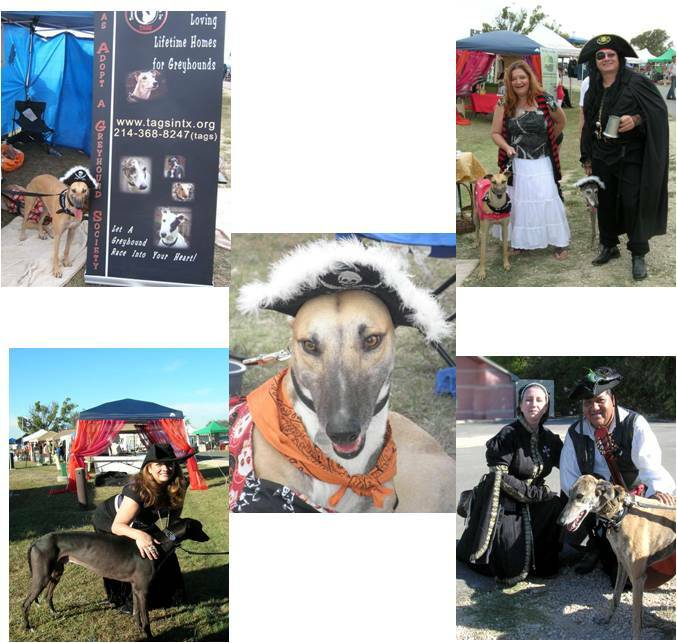 The hounds and volunteers of TAGS joined in the fun of Pirate Days in The Colony with costumes, decorations, funny language and lots of hugs, interest and donations by fellow mates and dog “lubbers.” TAGS was the recipient of entry fees for the Salty Dog Costume Contest and pitched in by emceeing the contest and distributing flyers to businesses prior to the event . The family-oriented weekend was full of all kinds of warm fuzzies. Thanks to the City of The Colony for allowing us to participate. Kristin Fields and Sean Watts, opened their home and fenced yard to TAGS Greyhounds, volunteers and owners. All of the Greyhounds took advantage of the acreage for free running and playing and the pools, both small and large. Some took advantage of having a private pool (Dasher and foster, Betsy) and others either dived into the big pool, fell into the pool or gingerly tested the water on the step – or all three. It was amazing how quickly the Greyhounds learned the location of the edge of the step into the deeper water and to slow down when they approached the tile. A few “retriever” Greyhounds (Dasher and Flower) led the pack when the tennis ball was thrown but the owners enjoyed running just because the others were doing it. After a while the shade looked inviting (Vixen in the foliage) and a rest was in order. Speaking of resting, fosters, Betsy, Shawnee and Runner, could not help but rest at the Orvis meet and greet after a full morning of running, playing and swimming. Thank you Kristin and Sean for opening your home for a fun day with the Greyhounds. 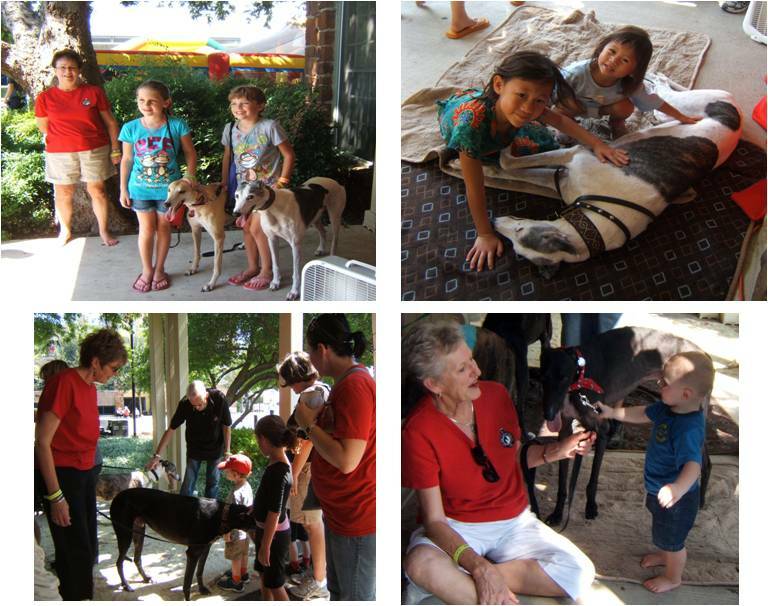 Take a look at the pictures and make plans to attend the next Greyhound Play Date and join the greyt fun. TAGS’ Greyhounds race into the hearts of the public and other adoption groups at the Unleashed indoor dog park event. In part TAGS was recognized because of its branding effort on the t-shirts for the event and the donation of a silent auction basket. Cards were exchanged with several groups with which we can possibly partner and best of all several attendees showed genuine interest in helping the greyhounds. The photo below does not reflect the constant flow of several hundred passers-by throughout the day. 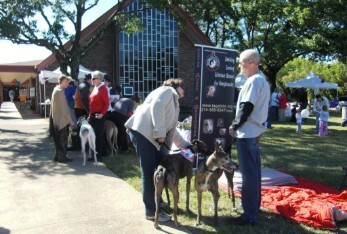 TAGS will continue to fulfill its mission of participating in large events and building partnerships with other non-profit agencies in order to provide homes for retired racing greyhounds by being involved in long-standing local attractions such as the Dallas Boat Show in July and Addison’s Oktoberfest celebration in September. 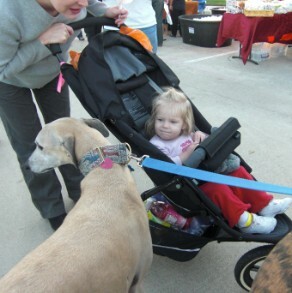 TAGS was invited as only 1 of 4 pet groups to attend the annual Plaza Days - sidewalk sale at The Plaza at Preston Center, Dallas. We had a wonderful turnout despite the on-off weather. 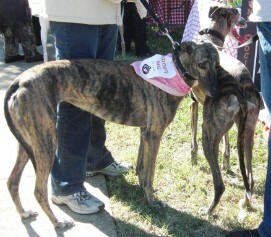 The event was very successful for the hounds - we received adoption applications for Runner and Sybil! We also collected donation making it a GREYT weekend. Friday, Saturday and Sunday, February 5, 6 and 7. The first weekend of the Dallas Boat Show was a great success! Don't miss out on the fun, come see us next weekend (see dates and times above). Friday, Saturday and Sunday, February 12, 13 and 14. The second weekend of the Dallas Boat Show was also a success! 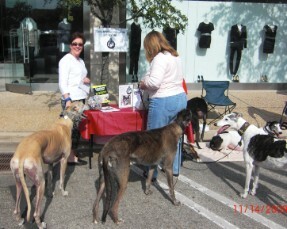 Thanks to all who participated and stopped by to visit and pet the Greyhounds. 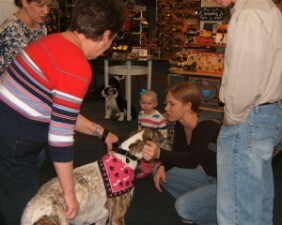 Saturday, January 16: Lots of people enjoyed petting the Greyhounds at TAGS' meet and greet at Whole Earth Provisions. Saturday, November 21, 2009, was early Christmas for lots of children, dogs, and adults when Santa came to TAGS at the Plaza at Preston Center in Dallas. Santa brought his big red chair, decorated his tall Christmas tree and placed wrapped gifts and toys under the tree, all in anticipation of long lines of children telling him what they want for Christmas. Photographer, John Hudson, was there to memorialize each child’s s smile, each parent’s pride and each dog’s lick (and some dogs trying to escape – we thought it was only children who are sometime a little leery of Santa). TAGS volunteers transformed a vacant store space into a Santa’s workshop and holiday store. 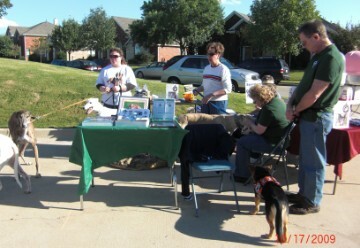 Volunteers and working service dogs from Assistance Dogs of Texas, Inc. joined the festivities. Look for a group shot of some of the assistance dogs. Children as young as three weeks and adults as old as (well, we won’t really say exactly how old) had memories made with Santa. 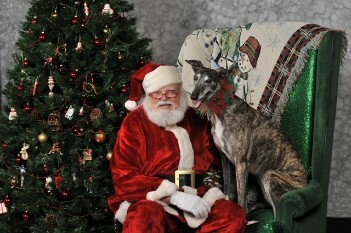 Dogs of many breeds (lots of Greyhounds) and mixed breeds told Santa what kind of cookies and squeaky toys they wanted. Of course, some got them while they were there. Lucky Dog Barkery provided yummy cookies for all the dogs. Refreshments were provided for the adults and children, too. Could it be that one foster dog from Paws in the City may have had an early Christmas wish granted? Many thanks to Kris Schuster, Claire Pulfer, Barb Bray, Debbie Canterbury, Kristin Fields, Sarah Bray, Helen Tuohy, Ken Spurlock, Suzanne Cody, Joanne Smith, Rock Ross, Suzanne Griggs, Jayme Skelton, and the volunteer elf, who got into the holiday spirit early and helped create the magic. Positive energy and laughter crackled in the air. TAGS’ first Santa Pictures event was an unqualified success, but it would have been nothing without Santa. Thanks, Santa, for making an early appearance. HAPPY HOLIDAYS FROM TAGS!! Saturday, November 14: Highland Park Village hosted its second annual dog adoptions event, Highland Park Village Dog Walk. Adoptable dogs from more than 10 rescue organizaions were onsite. TAGS was there between the Bloodhounds and the Italian Greyhounds. 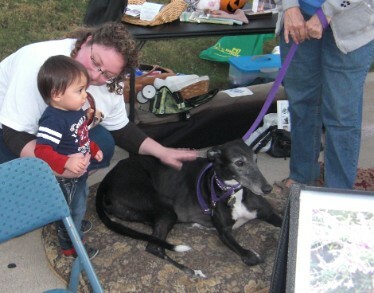 Saturday, October 17: Assistance Dogs of Texas teamed up with Texas Adopt A Greyhound Society for an information booth at The Legends Night Out. Jack and Jazz greeted the approximately 600 residents who attended the festivities.